Stuart J. Murphy’s I See I Learn picture books from Charlesbridge Publishing teach preschoolers social, emotional, cognitive, health and safety skills. Initially, I didn’t think JJ would like these books – because sometimes books with overt lessons aren’t engaging. However, it was quite the opposite. When we first read Emma’s Friendwich, we read it several times in a row because she loved it! And, the other books, too. JJ and I both like that the books have the all same characters who live near each other in the See-and-Learn City. A map showing where the characters live begins each book. The series began with: Freda Plans a Picnic, Emma’s Friendwich, Percy Plays It Safe, and Good Job, Ajay! Good Job, Ajay! is a book about building confidence. When Ajay thinks throwing a ball is too hard, his friend, Freda, reminds him that he’s learned hard things before like swimming. 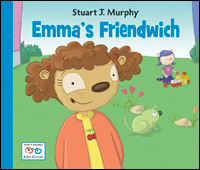 Emma’s Friendwich is a book about making new friends. When Emma is new to the neighborhood, she sees another girl and figures out how to make friends by smiling, saying hello, and asking if she can play. What a great model to teach children a practical life skill! Percy Plays It Safe teaches playground safety. Freda Plans a Picnic teaches sequencing. Percy Gets Upset teaches dealing with frustration. My Eight Year Old Only Likes Funny Books – Help!